Looking for polymer clay ideas for beginners? 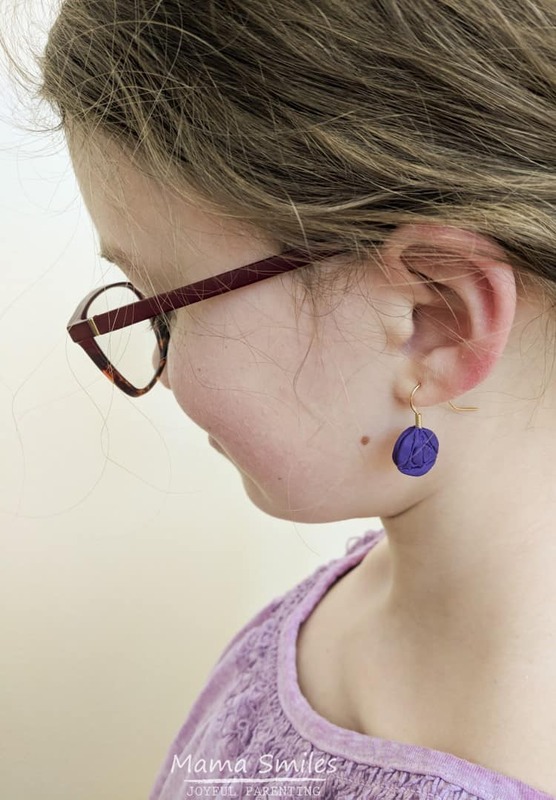 These DIY polymer clay earrings and tiny charms are easy and fun for kids to make. Sculpey polymer clay is one of my favorite crafting materials, one I’ve loved since I was a kid myself. It comes in vibrant colors that you can mix, amd it’s easy to manipulate into detailed shapes. It also bakes to a lovely professional finish. Today’s project features these lovely DIY earrings. They are super easy to make! My 5yo even made a couple pairs before moving onto charms (more on that soon). Earring hooks or earring posts. You can even buy clip-on earring findings for kids who want to wear earrings but don’t have pierced ears. You’ll also want jump rings if you want to make more dangly earrings. You can substitute screw eyes and a chain bracelet to make a charm bracelet instead of or in addition to earrings. Use your acrylic roller to roll out the clay in whatever colors you like. Cut out shapes using your Sculpey mini metal cutters. You can cut them out by hand as well, of course. Attach the shapes to your earrings hooks or earring posts or clip-on earring findings or screw eyes. All of the earrings featured in this post are double sided. Bake your earrings or charms. Be sure to let your polymer clay jewelry cool before handling. Check your package for instructions, but Sculpey clay usually bakes at 275F for 15 minutes per quarter inch. Earrings are, conveniently, about a quarter inch. We usually bake our clay on parchment baking paper. Can you recognize the design on these earrings that my son made as a gift for his sister? I have a hint for you: she loves all things Harry Potter. The kids also made some really great flying snitch earrings that I need to grab an photograph one of these days! 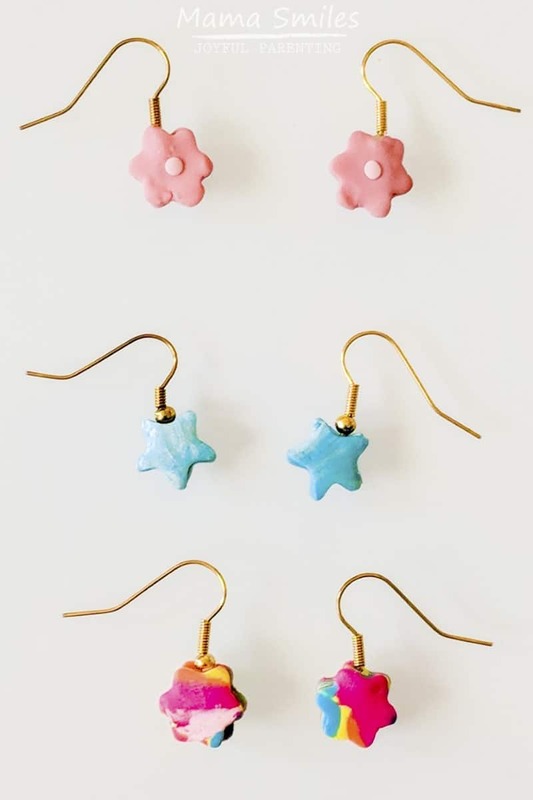 Have you ever made polymer clay earrings? 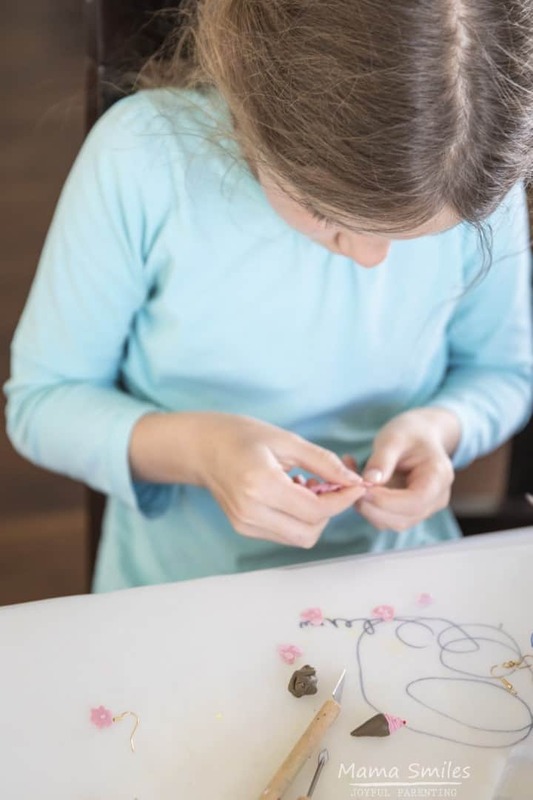 What other polymer clay ideas do you have to share that our family should try? Share your recommendations in the comments below, on my Facebook page, or by tagging me on Instagram. My daughter recently got into making charms and such, I should introduce her to the wonders of Sculpey…. And the Deathly Hollows earrings are awesome! I love polymer clay as well. Just made a while row of little candlesticks. I like the earrings very much.